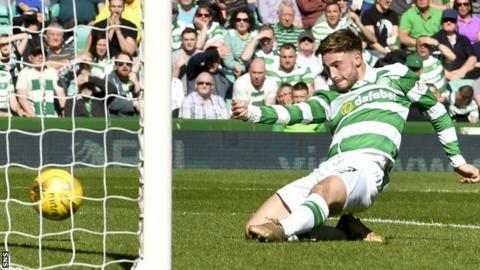 Patrick Roberts scored twice as Celtic extended their unbeaten domestic record to 43 matches this season with victory over St Johnstone at Parkhead. Tom Rogic and teenage debutant Michael Johnston forced Saints keeper Zander Clark into several first-half saves. Roberts put the champions ahead but Steven MacLean lashed in an equaliser. Dedryck Boyata headed home a corner and Roberts scored his second before substitute Callum McGregor added the fourth with a sublime individual goal. Victory moved the champions, who have now gone a year unbeaten domestically, 30 points clear of Aberdeen, who play Hearts on Sunday. St Johnstone, who suffered a first defeat in 12 'post-split' fixtures going back two years, remain in fourth, six points ahead of Hearts. Clark, making his first appearance in the Saints goal since the middle of March after replacing Alan Mannus, did not have to wait long to be tested. Within 40 seconds he was diving low to turn a powerful left-foot strike from Rogic from 25 yards round the post. Next he denied 18-year-old Michael Johnston, making his first-team debut, as he parried clear the youngster's right-foot 20-yarder. Rogic, in the advanced central midfield role, was creative and dangerous and another well-struck effort forced Clark to show his quality again with another top-class save. At the other end, Celtic keeper Craig Gordon, trying to play out from the back, passed the ball straight to Brian Easton but the Saints defender failed to take advantage. Danny Swanson fired an early 25-yard free-kick over the top of Gordon's bar, but the visitors wasted the best chance of the first half just before the interval when MacLean headed Easton's cross into the path of Blair Alston 12 yards out, but the Saints midfielder sent his shot over the bar. With Johnston producing flair on the left flank, fellow 18-year-old Anthony Ralston was enjoying his first start for the hosts at right-back, overlapping regularly to add another option to Celtic's attack. Johnston was at the heart of the move that led to Celtic's opener on the resumption, his pass releasing Roberts, who from just outside the 18-yard box, sent a low left-foot strike into the bottom right-hand corner. Saints responded within 90 seconds. MacLean's header from Paul Paton's cross was blocked on the line by Gordon, but as the ball broke free MacLean followed up to level the score. Three minutes later Celtic regained the lead as Boyata rose unchallenged to head home a Roberts corner. The champions increased their advantage just after the hour after slick build-up play. Griffiths fired in a shot which Clark parried, but substitute Scott Sinclair reacted swiftly to cut the ball back for Roberts to claim his second of the afternoon from close range. Celtic were flying now and Sinclair, who had replaced the impressive Johnston, almost produced a magnificent solo goal, eluding numerous challenges before being denied by Clark. Instead it was McGregor, only on the pitch for a minute after replacing Rogic, who claimed the game's classiest goal with a mazy run that left several Saints defenders in his wake before sweeping a low shot into the net for his third goal in three games. Celtic boss Brendan Rodgers: "It was a really exciting performance for the supporters and a joy to watch the team play to that level. "We were very good for the first 35 minutes without getting the goal, but we started the second half really well, and just switched off for some reason to concede the goal. "But our response was spectacular. We scored four goals, and maybe could have finished with six or seven if we had been more clinical. "I've been encouraging Patrick [Roberts] to get into the box because with his quality, he has the ability to score more goals, and it was a great bit of individual skill from Callum [McGregor] - he is performing at a really top level. "I was delighted with the two young players who made their first starts. You can see the profile of Mikey Johnston, he is very similar to Scott Sinclair - slight, fast, dynamic. With more involvement he will become a bit more prolific and incisive but he was quick and direct and most importantly worked very hard to press the play. "I thought Tony [Anthony Ralston] was exceptional. You can see the maturity now in his performance; you would think he'd played 50 games already. He's a very good defender, very hard to beat, very strong, but he can play football and has the agility to get forward. It was an outstanding first start from him." St Johnstone boss Tommy Wright: "I thought Celtic were exceptional, they played particularly well, but I am disappointed that when we got back to 1-1, we gave away a poor goal to put them back in control of the game. "If you keep it level for 10-15 minutes, then you might get something out of the game. But it was just wave after wave of attack. "It was a tough day for us, but at 4-1 with 20 minutes to go, it could have been a lot worse. We defended and made sure we came away with a 4-1 defeat and not a heavier one. "But the second and third goals were poor goals from our point of view." Match ends, Celtic 4, St. Johnstone 1. Second Half ends, Celtic 4, St. Johnstone 1. Dedryck Boyata (Celtic) wins a free kick on the right wing. Foul by Craig Thomson (St. Johnstone). Attempt saved. Leigh Griffiths (Celtic) left footed shot from the right side of the box is saved in the bottom left corner. Attempt saved. Stuart Armstrong (Celtic) right footed shot from the centre of the box is saved in the centre of the goal. Paul Paton (St. Johnstone) is shown the yellow card for a bad foul. Corner, Celtic. Conceded by Liam Craig. Attempt missed. Scott Sinclair (Celtic) right footed shot from outside the box is high and wide to the right. Goal! Celtic 4, St. Johnstone 1. Callum McGregor (Celtic) left footed shot from the centre of the box to the bottom right corner. Substitution, St. Johnstone. David Wotherspoon replaces Blair Alston. Attempt missed. Scott Sinclair (Celtic) right footed shot from the right side of the six yard box is close, but misses to the right. Attempt saved. Scott Sinclair (Celtic) right footed shot from outside the box is saved in the centre of the goal. Richard Foster (St. Johnstone) wins a free kick in the defensive half. Craig Thomson (St. Johnstone) wins a free kick in the defensive half. Goal! Celtic 3, St. Johnstone 1. Patrick Roberts (Celtic) right footed shot from very close range to the centre of the goal. Assisted by Scott Sinclair. Substitution, St. Johnstone. Craig Thomson replaces Graham Cummins. Attempt missed. Stuart Armstrong (Celtic) right footed shot from outside the box is close, but misses to the left.